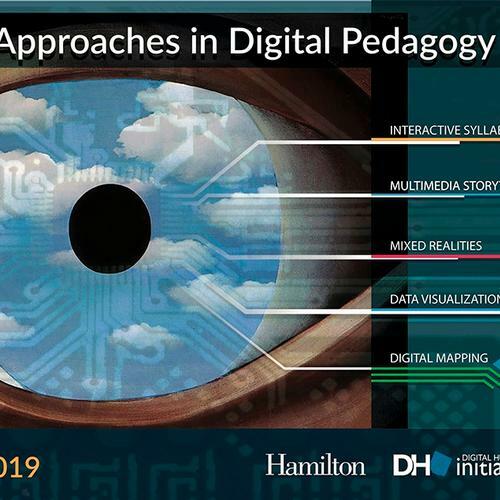 Visual Approaches in Digital Pedagogy comprises a series of paired presentations and hands-on tutorial sessions designed to foster discussions focused on the integration of digital technologies, experiential learning, and visual communication. Visual Approaches in Digital Pedagogy comprises a series of paired presentations and hands-on tutorial sessions designed to foster discussions focused on the integration of digital technologies, experiential learning, and visual communication. Led by Visiting Associate Professor of Art History James (Jay) Bloom, the presentations introduce sample digital projects that model a range of multi-disciplinary pedagogical opportunities, from interactive syllabi to multimodal platforms for the presentation of both undergraduate and professional research. The workshops that follow each discussion are intended to provide opportunities for faculty to explore a rich continuum of technologies through which to advance their teaching and research goals. Discussion session: The syllabus is an inescapable fixture of academic life. It is, in its analog form, inherently linear – if only through its essential chronological structure. But what if a syllabus could be a multi-modal, visual map of the course, replete with embedded media (videos, images, animations), links to external content (museums sites, news stories, research engines), as well as practical course information, all governed by an interactive timeline that permitted the visual apprehension and exploration of simultaneous or co-extensive events? Lunch will be served. Article: Bruzelius, Caroline, and Hannah L. Jacobs. The Living Syllabus: Rethinking the Introductory Course to Art History with Interactive Visualization. 2017. Develop an interactive Syllabus or Research Project Timeline of your own design in a follow-up session exploring the potential of several technologies. This discussion session explores an array of accessible, entry-level digital projects that faculty might consider for integration into their courses as a means to sample digital pedagogy. Interested in visualizing change over time? Small-scale data visualization (graphs, charts, etc.)? Network analysis? Digital storytelling or scholarship? Discussion will focus on multimedia course and research projects that integrate the history and culture of our college campus. Lunch will be served. Develop a digital publication! Use Scalar and Google Apps to develop a publication for course or research efforts. The Spring 2019 Visual Studies Series is co-sponsored by Art History, the Digital Humanities Initiative (DHi), Dean of Faculty Offices, Experiential Learning, LITS, and LITS Research & Instructional Design (R&ID).